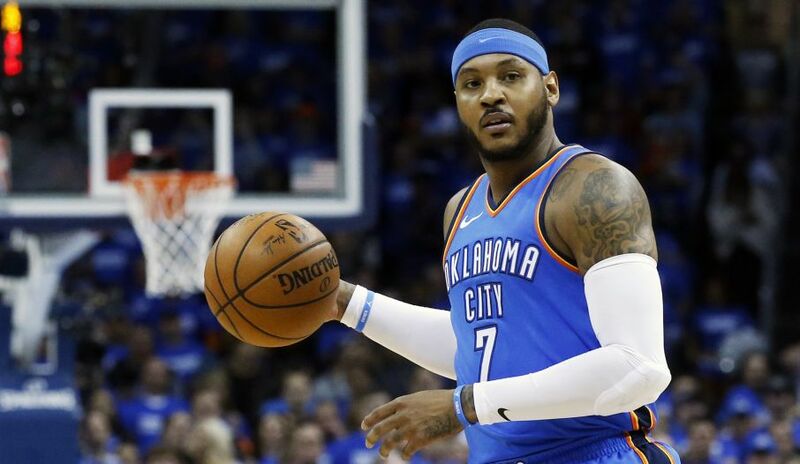 The 10-time All-Star’s short stint with the Oklahoma City Thunder appears to be over as the team has traded Carmelo Anthony and a 2022 protected first-round pick to the Atlanta Hawks in exchange for Dennis Schroder and Mike Muscala. The trade quickly became a three-way deal, as the Thunder send Muscala to the Philadelphia 76ers in exchange for Timothe Luwawu-Cabarrot, according to league sources. The sources also stated that Carmelo will be waived by the Hawks, and most likely be signed by the Houston Rockets. The Houston Rockets are the frontrunners to land Carmelo Anthony with the odds of -200. Carmelo Anthony is in his last two years of high-quality talent, and many of us are aware that the talent of NBA players declines rapidly after the age of 34 – and Carmelo is 34. By going to the Rockets, Carmelo will have a chance to escape the fire of Allen Iverson, John Stockton, Charles Barkley and the likes – the players with no rings. The Rockets will be Carmelo’s final chance to win a championship, and Carmelo’s addition to the Rockets would rattle the NBA. The Warriors will have to face a Rockets team with Chris Paul, James Harden, and Carmelo Anthony to get to the Finals. The Heat and Lakers have also appeared into the trade talks for Carmelo Anthony, with the Lakers trying to snag any star they could get to play alongside James, and the Heat warming up to trade talks for Carmelo Anthony. The new motivation springs from the possibility that the Rockets are considering signing Clint Capela to a 5-year deal, which would leave no room to sign Carmelo Anthony. The Heat and Lakers both have odds of +500 to landing Carmelo, who has scored over 25,000 career points. Nearly every team trying to trade for Carmelo Anthony is skeptical of the former superstar’s age and the possibility of his talent declining next season. Certain teams may want Carmelo to come off the bench, but the stubborn star is objective to that notion – forcing owners to question his coachability. Was that really a surprise? Carmelo has always wanted to be the face of a franchise, and to be “the man”. However, father time has caught up to Carmelo, and the decision for a team to take on the gamble of his talent is on the brink. The three-time gold medalist will have to prove himself to the league. The Rockets are iffy about acquiring Carmelo Anthony, who is set to make a staggering $27.9M this year, as he has been known for his defensive incapabilities. Additionally, Carmelo Anthony, who has been on six all-NBA teams, shot 40% from the field last season – his career-worst shooting percentage in a single season. Anyone with a head knows that Carmelo will help the Rockets offense, but the organization is hesitant because of Carmelo’s defensive abilities. The Rockets thrived with Trevor Ariza on the court, mainly because of Ariza’s defensive pressure. Ariza departed for the Suns, and the Rockets are looking to replace him with Carmelo Anthony. All signs say that the Rockets are willing to take a chance on Carmelo as they are still pursuing him. The Rockets know that somewhere deep inside Carmelo Anthony is a sleeping giant, as the former NCAA champion has averaged over 20 points per game for 14 straight seasons to start his career. Why are the Rockets the favorites to land Carmelo Anthony with the odds of -200, according to Delaware Park Sportsbook? The deal is simply too good to resist for the Rockets, as the would-be trio of Paul-Harden-Anthony would change the dynamics of the West, and most likely the entire NBA. As far as exiting the league with a ring, Anthony’s last stand, his Alamo, is the Rockets. With the powers of Paul-Harden-Anthony, the Rockets could definitely pose a threat to the reigning Warriors.